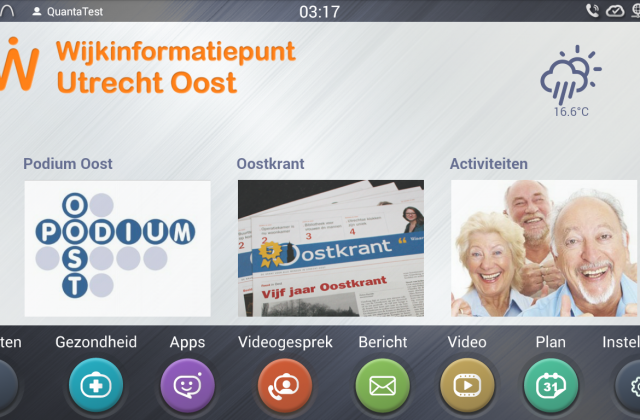 As of today, in the district of Utrecht East, 25 senior citizens participate in the QOCA pilot for the community. For residents, a QOCA home hub is placed allowing them to easily search online information about the neighborhood. They can also contact other pilot participants and their own caregivers, is what Anja van der Aa told the participants at Taiwan Business Day yesterday. 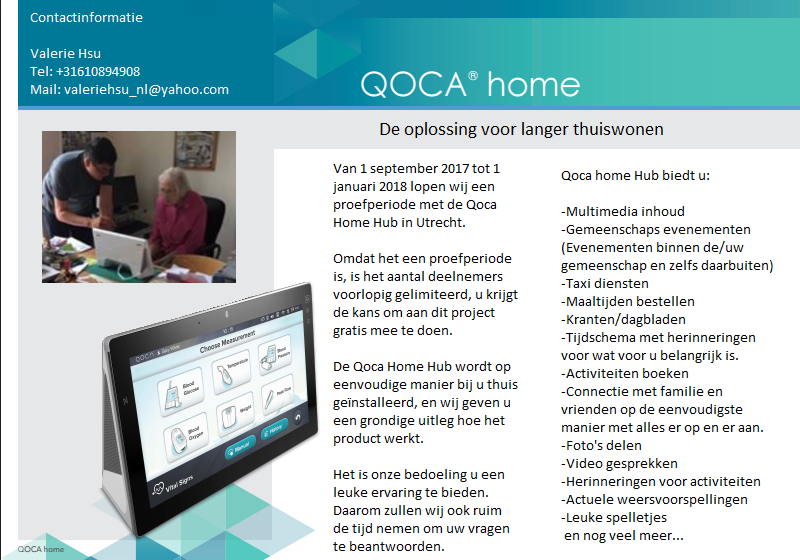 The QOCA home hub provides all possibilities for ‘social communication’. In addition to online contact, participants can also sign up for activities and facilities that are available specifically for them in the Utrecht East and Utrecht area. 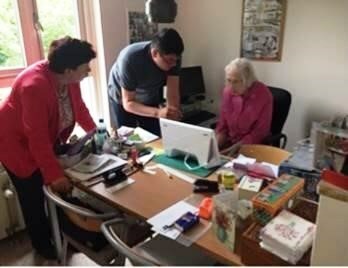 To register for a course in the community, to read the community newspaper “Oostkrant”, 50+ newspaper “de Oude Utrechter“ or to sign up for transportation, it requires only a single action of the participants. All participants are personally supervised by an independent elderly counselor from the community. She informs the participants and is available for questions. Technical questions are passed on to a help desk. The pilot is an initiative of the Community Information Center Utrecht East (Wijkinformatiepunt Utrecht Oost). The community agenda of the Community Information Center Utrecht East, filled with almost a hundred of activities in the community, can be found on the QOCA home hub. Activities of the cultural meeting place Podium Oost and of U Centraal are also available. Through the current overview, participants can register directly for an activity. Via the QOCA home hub, communication with your own general practitioner or the local neighborhood team will also become possible. During the pilot phase, what is needed to realize ‘medical communication’ is being investigated. Care professionals are actively involved in getting answers to their questions about privacy and implementation. The pilot was made possible by the Municipality of Utrecht, Economic Board Utrecht (EBU), Taiwan Globalization Network (TGN) and ROC Midden Nederland. ROC students are available to assist with communication and installation. The QOCA home hubs are made available by Quanta Computers Inc., which is one of the largest manufacturers of computers in the world. They also manufacture the laptops for Apple, Dell and Hewlett Packard.